February | 2012 | Small Farmers. Big Change. In early November 2011, Equal Exchange traveled to the West Bank to meet with the members of the Palestinian Agricultural Relief Committee (PARC) from whom we are now buying organic, fairly traded olive oil. Equal Exchange and PARC are both grounded in the most fundamental industry on earth: agriculture. Both of our organizations are committed to enabling small-scale farmers to remain on their land by working with their co-operatives, to growing quality products, and to building sustainable markets. Working with a Palestinian group in the West Bank is particularly compelling given that this tiny spec of land in the Middle East is the source of more enduring conflict and heartache than practically any other in the world. Equal Exchange launched its new line of organic, fairly traded olive oil after years of discussions with personal friend and Palestinian olive oil pioneer, Tania Maxwell, who has marketed PARC’s oil under her Olive Branch Olive Oil brand. Tania’s experience and relationships proved invaluable in enabling us to form our new partnership with PARC, and she helped arrange our visit to the West Bank and accompanied us on the trip. Today PARC works with 41 co-operatives, each made up of anywhere from 20-80 members. These groups grow olives, couscous, almonds, dates and other products. They co-manage the plows, as well as the fertilization and harvesting of crops, and the maintenance of storage facilities. PARC’s stated target constituencies are farmers, women, and youth. In addition to promoting viable and sustainable economic development, PARC has also built community-based organizations and tries to instill transparency, accountability, and democracy in these organizations. The Equal Exchange group included the two of us, Co-Executive Director Rink Dickinson, and Tania Maxwell. We spent a day at the Al Zawyeh co-operative, one of the co-ops that currently supplies olives for our finished product, which is sold in 500ml bottles. The co-op was formed in 2008 with 18 members and has since grown to 22. Al Zawyeh was formed to counter the vulnerability of individual farmers to the greed of intermediary traders. According to co-op president Ismail Hamondo, the benefits of the co-operative are numerous: large-scale purchases, which have lowered the costs of production for farmers and the price they pay for pressing; as well as shared best practices in pruning, plowing and collection. In addition farmers are learning how to build democracy. The co-op also plays a social role in the community, which among other things, assists students in finishing high school. Fair Trade income in the first couple of years has helped build a barn for sheep, and secure and distribute organic compost. Even though Sania is university-trained as a social worker, she decided to become a farmer when she inerited her father’s land. On another day of our trip, we visited an olive oil press used by the Banizaid Alsharaya co-op. The press is owned by a father and son member of the co-operative. Once the olive harvest begins, the press runs 24 hours a day for two months. The whole community helps to load and unload bags of olives and the press is a gathering point for farmers and youth during this time. At the press, we watched as the olives traveled up a conveyor belt. Leaves were blown away and the fruit was washed by machines. Then the olives were crushed—pits and all—and the oil was filtered. Later it was siphoned into containers and transported back to the co-op to be stored in stainless steel tanks. In the future the Banizaid Alsharaya co-op plans to purchase a press that is owned and controlled by all of its members. And next year, the Al Zawyeh co-op will join with three other co-operatives to buy its own pressing station. In December of each year, which is mid-to-late harvest, PARC sits down with all the co-operatives to determine the exact price of that year’s olive oil. As with most co-operatives, PARC and the co-ops establish one price for all of its members. Every year the extraction rate is different for individual farmers. Since it fluctuates every year, the co-ops have agreed to establish a single price per member for each harvest. PARC also determines prices for the domestic market, the export market, for virgin and extra virgin, and for certified organic; these always exceed the cost of production and meet or exceed the established Fair Trade price. As orders come in, PARC collects the oil at the co-op stations and bottles it at the facility of Al Reef, PARC’s nonprofit exporting organization, owned by all of the co-ops. Over the last 5-6 years, there have been enormous gains in capacity, quality control and bottling equipment. We were extremely inspired by what we saw and confident that processes and skilled people are in place to yield an extremely high-quality bottle of organic extra virgin olive oil. Two factors have contributed to the relatively recent development of co-operatives in Palestine. First, the disappearance of the Israeli market after the second Intifada in 2000 forced Palestinian farmers to pursue other export markets for their olive oil. This path led them to the Fair Trade market and its requirement for volumes and consistent quality with various elements of documentation. The second factor was the Islamic tradition of passing land on to your children. For example, if a father passes his 12 dunums (approx. three acres) of land to three children, they each receive four dunums if they are all boys; girls receive one half of what boys do. This has led to the land becoming fragmented and in turn more likely to be abandoned and to drop out of productive use. Together with the promise of profitable markets, forming a co-op meant a new incentive was created for individual landholders, like Sania, to band together. It’s impossible to separate the struggles of Palestinian olive farmers and our trade relationship from political struggles in the region: access to water, the barrier wall, checkpoints, settlements, and frustration with the Palestinian Authority. For Equal Exchange, this trip provided a first opportunity to begin learning how we might best contribute to just economic development in the West Bank. We return sober about the prospects for an enduring peace in the region but highly motivated that our smallest of roles is a contribution in that direction. The Sierra Madre of Chiapas, Mexico, stretches South all the way to Honduras. Equal Exchange buys coffee from several co-operatives along this vast and dramatic mountain range. One super dynamic place is the area commonly known as “Jaltenango,” but officially known as Albino Corzo. The mountain ranges of this area are part of El Triunfo. The entire length of the Sierra Madre also includes the redoubts and byways for the massive illicit traffic that traverses them; this traffic affects every facet of life in this region. Most importantly, the folks of the Sierra Madre also produce some of the great traditional washed, mild coffees of Mexico and Central America–the area biologically known as Mesoamerica. In 2007, Equal Exchange connected with a group of co-operatives based in Jaltenango, whose members are spread over a wide geographic area. The members are primarily members of Ejidos, a form of legal communal land ownership common throughout Mexico. Our partnership has focused on quality improvement and in-depth analysis of the agricultural practices of the co-op members. The co-operatives operate in areas that are legally designated as a biosphere; the biosphere has two types of designated areas: the nucleus and the buffer zone. Human activity in the nucleus areas is restricted to scientific studies and extremely limited tourism controlled by the state. The buffer zone includes and promotes the sustainable development of the human communities that existed in the area prior to the establishment of the Park by the State and Federal Governments. The buffer Zone in El Triunfo is five times the land area of the nucleus. Globally the vanguard of the conservation movement focuses on the development of sustainable human economies for the protection of true wilderness. In the Sierra Madre, sustainable coffee production is the cornerstone of the local economy and the key to the continued protection of the remaining forests and its inhabitants; read: biological diversity and watershed productivity. The intention of the co-operatives is to practice sustainable coffee production and direct export. The co-operative members live in communities that control large areas of communal lands that are contiguous with nucleus areas, including existing forest, much of which is in an eco system service payment program through the federal government. The communities’ forests are located in watersheds that produce tremendous amounts of water. The Sierra Madre is like a huge sponge jutting out of the Pacific Coast some 2,500 meters above sea level; 1500 msnm is the transition to cloud forest which pulls water from the winds off the Pacific Ocean. This water falls and is absorbed into the watersheds of the Sierra Madre which divides the water–much as the continental divide does–between the plains of the pacific coast and inland Chiapas with outflows to the Gulf of Mexico. The federal payments are minimal, but are part of what is growing the global market for eco system services including water production and carbon sequestration. The road to commoditization of eco system services is fraught with peril but yet untold. The water from El Triunfo is part of the fundamental civil and ecological infrastructure of all of Southern Mexico including: coffee farming, cattle farming on the coast, human consumption, forest production, industry and electricity production, to name a few. 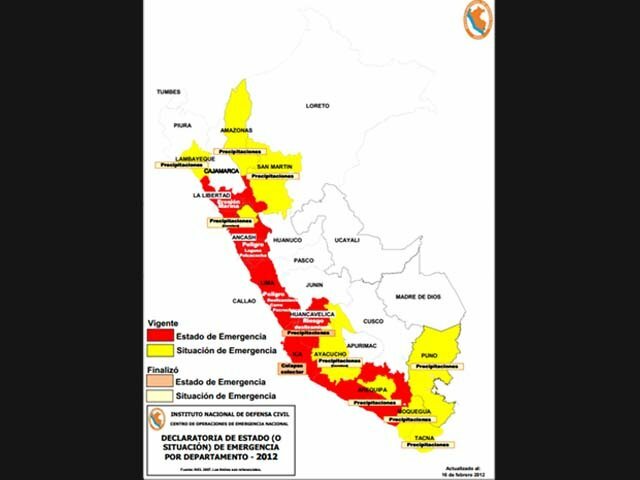 It is imperative that we maintain the forests of El Triunfo for the ecological and economic survival of Southern Mexico and the broader Mesoamerican corridor. Further ecological deterioration along the Sierra Madre will exacerbate the existing profound social conflict and poverty present in the region. Despite the enormous complexity and difficulty involved with developing value chains in this environment, we have prioritized it. The first priority being to focus on maintaining and improving productivity at the farm level, the theory is increased productivity increases farm income and increased farm income decreases pressure to exploit the natural resources available in the biosphere. Despite the other many factors that influence farm income, not the least of which being relative currency value fluctuations, I believe that farm productivity is fundamental to the success of individual farms but also the agribusinesses associated with those farms: co-operatives, exporters, importers, brokers, roasters.After an initial review of on-farm practices it was clear that the majority of the co-operative members were not consistently practicing critical farm management techniques such as pruning, adequate fertilization, and old tree replacement; further, no one had ever done soil tests to determine what was needed. Many of the farmers were practicing traditional coffee production which can be certified organic but typically results in low yields unless the farm is on new or virgin soil – something to be avoided in the biosphere. Based on those results Equal Exchange funded a two-part project. 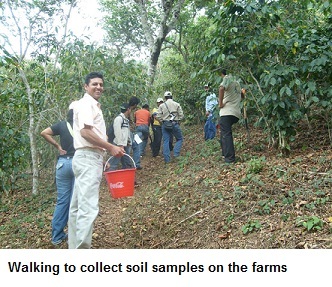 The first phase included community meetings and trainings on soil analysis by watershed and the acquisition and interpretation of 152 soils samples in the watersheds of Sierra and Cuxtepeques. 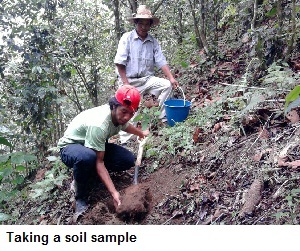 Based on the results of the soil analysis it was clear that one of the best options was to build a regional composting facility to produce the great quantities of compost necessary to cover the needs of all the members of the co-operatives. Each tree of coffee requires at least two pounds of compost per year; each farmer has between 2,000-10,000 trees – you do the math. Additionally, it’s difficult to acquire all the necessary ingredients to create a compost that contains the necessary nutrients to create a high yielding farm. In the second phase we bought a Jeep so the co-operative’s agronomists could visit the far-flung membership to provide technical assistance and training on farm management techniques like pruning, tree replacement and shade tree management, among others. During this phase they had 25 community meetings and visited over 500 farms, and they continue to provide assistance and follow up to 365 farmers. Perhaps most importantly the technical staff developed a solid proposal for the construction of a regional composting facility for which they have received funding in 2012. Days before my last visit a Colombian consultant had just finished up the technical details of the facility and the co-operative hopes to begin construction and operation in the next six months. The facility will be built on land the co-operative acquired to build a dry mill two years ago. It is exciting to see the pieces of the productivity puzzle slowly come together and I look forward to seeing the results of our early work in the watersheds of Sierra and Cuxtepeques. This morning I watched the rain pour over New England and thought about the plan for future work we are going to do with the farmers of the Sierra Madre. Look for Organic Mind Body and Soul, make a French press, and dream about the goings on in the cloudy Sierra, and send the families who work there all the productivity energy you can muster. 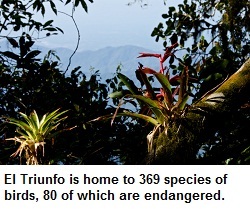 El Triunfo Biosphere Reserve protects cloud forests on the upper slopes of the Sierra Madre, as well as the wet tropical rainforests of the Soconusco on the Mexican Pacific. It is also home to 15,000-18,000 people who grow coffee, much of which is exported to the United States, and is the basis for the regional economy.El Triunfo is a federally protected natural area in the Mexican state of Chiapas; it was the first reserve to enroll in the UNESCO Man and Biosphere (MAB) program in 1993. Today it is joined by 580 reserves in 114 countries in the World Network of Biosphere Reserves, and is recognized as one of the most biologically diverse parks in Mexico. The general objective of El Triunfo is to contribute to the conservation of the natural heritage of Mexico through the promotion of a culture of preservation and sustainable development of the communities in the biosphere. It also seeks to maintain the biological and ecological functions of the ecosystems of the reserve and to engage the active participation of the population and institutions involved in conservation activities. The majority of the reserve is a working landscape including community forestry, coffee cultivation, cattle ranching, corn and bean farming, in an area of 119,177 hectares (460 sq. miles). The nucleus areas total 25,763 hectares (99.5 sq. miles) divided into five polygons.Here is where Equal Exchange and your daily dose of coffee come in. El Triunfo is committed to the MAB goal to combine the three functions described below and be a place of excellence for the testing and demonstration of methods of conservation and sustainable development on a regional scale. My farm visits over the years have taken me over hill and dale throughout the region and my recent trip cemented it as one of the most special and beautiful places I have ever visited. People have been living in this area for a long time creating a rich human history; the mountains have been around since the Pleistocene era and sport amazing tree ferns, provide habitat to uncounted species of animals, amphibians, reptiles, insects and birds. In the nucleus area it feels like you just walked into “The Land Before Time”; I was certain there could be dinosaurs around the next corner. I don’t think I can yell loud enough, write enough stories, show enough pictures to explain how important the continued conservation of this area is for the people, the animals, the plants and the regional ecological health. Take a breath, close your eyes and think of the places you know that give you that divine sensation of our interconnected universe. El Triunfo is one of those places. You can support El Triunfo in a variety of ways but let me emphasize two. One, buy Mexican coffee from the coffee farmers Equal Exchange has partnered with. Two, change your consumption habits to reduce your ecological footprint. 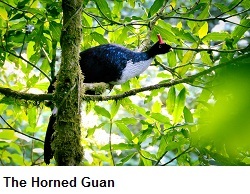 Climate change is a real force in the reserve today with real economic and ecological impacts. Increased intensity of storms has caused massive landslides killing people and destroying farms; changing or variable rains influenced by the temperature of the Pacific Ocean currents change the fruiting pattern of the forest and endanger many animal species. Support small farmers and ride your bike. For more stories and stunning photos from the Triunfo Biosphere, please visit here tomorrow or go to Equal Exchange’s web site. The countries are different. The specific challenges vary. But the key message we’re getting from small farmers across the globe is consistent: climate change is already severely threatening coffee production. How do you address a problem that is a global concern but that is wreaking havoc in different ways in different communities? Small farmer co-ops in Mexico are leaders creating models of sustainable farming. This winter they also became leaders in organizing others to take united action against climate change. They hosted a conference to discuss these complex issues and to build the forces for good (good coffee and good stewardship). Their creativity and commitment are a formidable counterweight to climate change in their region. 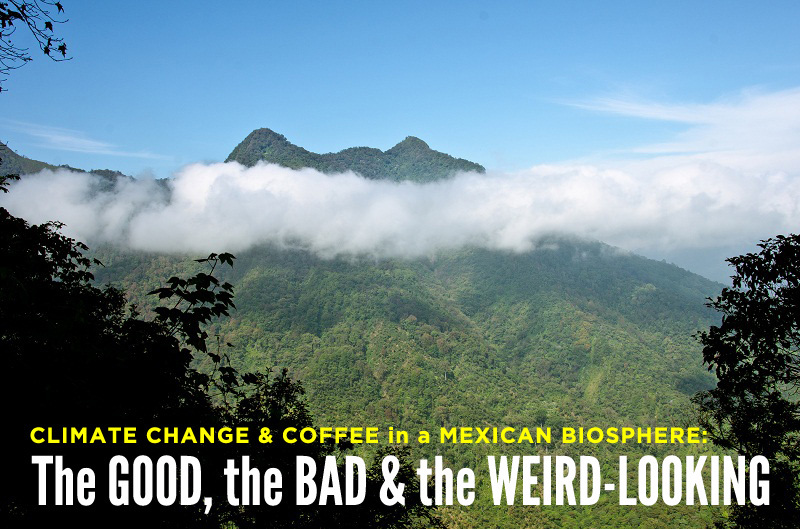 Our coffee sourcing specialist, Todd, and our brewing equipment guru (and great photographer), Joe, were invited to attend the conference and to hike into the remote biosphere preserve El Triunfo. This park is so important – and so fragile – that only 6 groups of visitors are permitted entry per year. For more stories and stunning photos from the Triunfo Biosphere, check back tomorrow or visit Equal Exchange’s web site.